A sum-to-zero contrast codes a categorical variable as deviations from a grand mean. Social scientists use them extensively. Should ecologists? EDIT the first version of this post that went up had some bugs in it. Hopefully all fixed now. EDIT2 Annnd the second version still had bugs. Maybe fixed now. Centering continuous variables eliminates collinearity between interaction and polynomial terms and the individual covariates that make them up. Centering does not affect inference about the covariates. Centering can improve the interpretability of the coefficients in a regression model, particularly because the intercept represents the value of the response at the mean of the predictor variables. Predicting out of sample data with a model fitted to centered data must be done carefully because the center of the out of sample data will be different from the fitted data. There may be some constant value other than the sample mean that makes more sense based on domain knowledge. To make the discussion concrete, let me demonstrate with an example of the interaction between a continuous covariate and a categorical one. In the following I refer to the effect of individual covariates outside the interaction as the “simple effect” of that covariate. The intercept of this model isn’t directly interpretable because it gives the average width at a length of zero, which is impossible. In addition, both the intercept and simple effect of length represent the change in width for only one species, setosa. The default contrast in R estimates coefficients for \(k - 1\) levels of a factor. In the simple effect of a factor each coefficient is the difference between the first level (estimated by the intercept), and the named level. In the above, Speciesversicolor has sepals that are 1.4 mm wider than setosa. The interaction coefficients such as Sepal.Length:Speciesversicolor tell us how much the effect of Sepal.Length in versicolor changes from that in setosa. 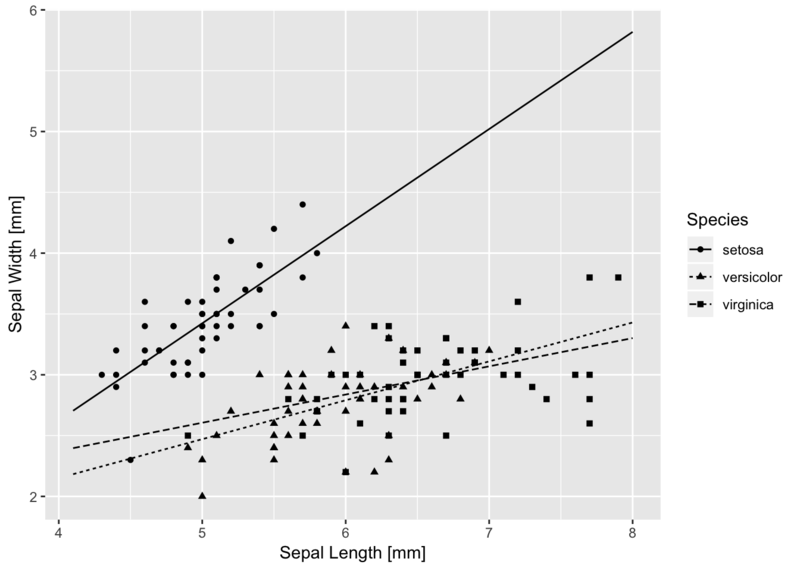 So every mm of sepal length in versicolor increases sepal width by \(0.8 - 0.48 = 0.32\) mm. Maybe a plot will help. I did something rather silly looking there because I wanted to see where the curves cross x = 0. That is where the estimates for the intercept and simple effect of species are calculated. The intercept is negative, and the line for setosa crosses x = 0 well below y = 0. The simple effect estimates of Species are both positive, with virginica being larger, and indeed the line for virginica crosses x = 0 at the highest point. 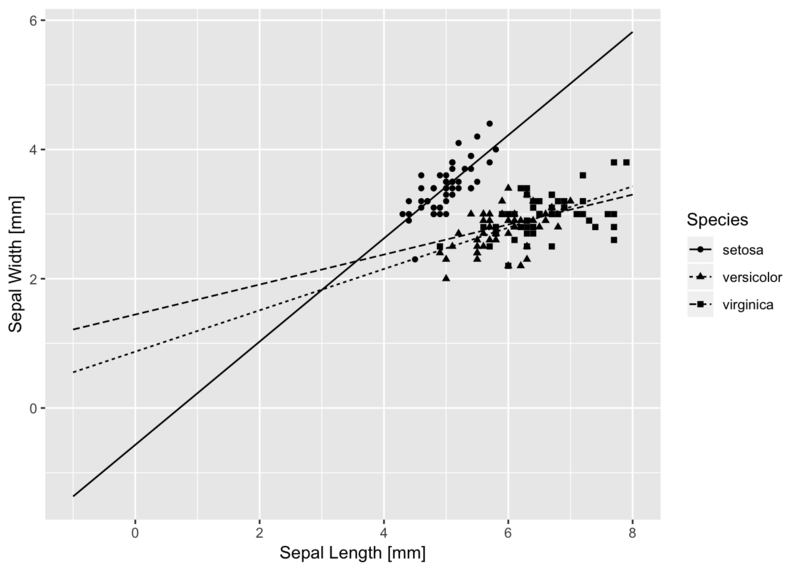 Similarly, the simple effect of length is the slope of the line for setosa, and it is larger than the slopes of the other two species because the estimated interactions are both negative. But not centering really makes things ugly for direct interpretation of the estimated coefficients. 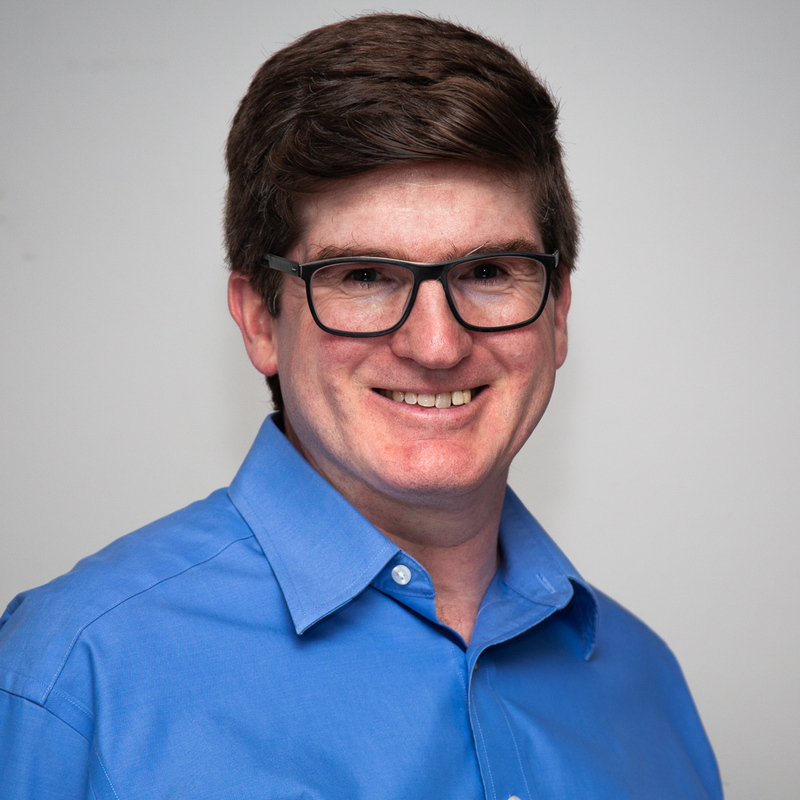 library(dplyr)  #Stay in the tidyverse! Estimates and t-statistics for the continuous covariate, including the interaction terms, do not change. The t-statistics for the intercept and simple effect of species do change because now the model estimates the differences between the species at the mean length. That’s OK, because they are really testing something quite different from before. Just to confirm that the graph isn’t different. # remember to center the newdata values by the original mean! What happens if we use sum to zero contrasts for species? I can now directly interpret the intercept as the average width at the average length, averaged over species. Similarly the simple effect of length as the change in width averaged across species. This seems like a very useful set of coefficients to look at, particularly if my categorical covariate has many levels. You might ask (I did), what do the categorical coefficients mean? They represent deviations from the mean intercept for each species. But what is species 1 and species 2? With sum to zero contrasts those coefficient refer to the first k-1 levels, so species 1 is setosa and species 2 is versicolor. OK, you say (I did), then where’s species virginica? After much head scratching, the answer is that it is the negative of the sum of the other two coefficients. I just thought of something else. Are those “average” intercept and slope the same as what I would get if I only use cSepal.Length? Whoa! It is not the same, in fact it is radically different. Totally different conclusion about the “average” effect. This is closer to the conclusion obtained with the interaction model. I have seen assertions in some papers (particularly from social sciences), that using sum to zero contrasts (also called effects coding, I believe), allows the direct interpretation of lower order terms in an ANOVA table even in the presence of interactions. If so, in this case I could say “Sepal Width differs significantly between species.” I’m not sure I believe that. The ANOVA table is identical between all 3 models, whether I use sum-to-zero contrasts or not. Why should the interpretation differ if I just change the parameterization of the model? Explaining treatment contrasts to students is a pain. I’m not sure that these are any easier. I have a few thoughts about the effects of sum-to-zero contrasts and model averaging, but that will have to wait for a different post.